Thoughts? We purchased a Brown Carpet Anemone on Wednesday and the shop owner mentioned that he thought the animal would be splitting soon (you could tell by the foot). By Friday the anemone was on the move and the two halves were moving further and further apart. Then all of the sudden he became mucusy/slimy. By Saturday night he was closing in and was more slimy. By Sunday morning he looked worse so we removed him from our primary tank. 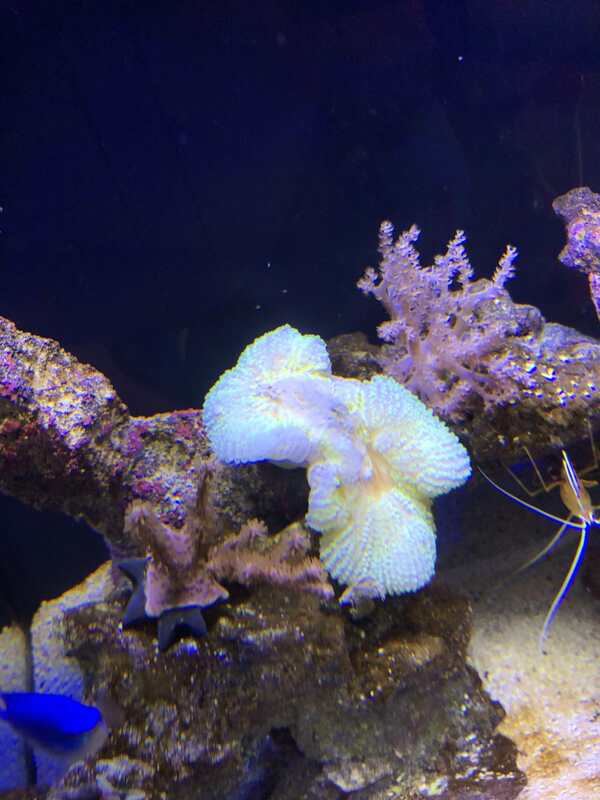 Were our tank values off or could it have been too much change for a splitting anemone? I’m pretty sad. Also, this morning and all day our corals have been closed or shriveled. I know anemones can release a toxin when they die. Is there anything we can do to give them a little boost to ensure their health? I am new to this hobby and I look forward to learning from you. Thank you for your time! There are 3 Clownfish hosting carpet anemone species, S. mertensii, S. haddoni and S. gigantea. They do not natural split. If you try to divide them, they will died almost every time, at least one of the two will died 100% of the time. Rarely one of the two halves will survive, but weaken and died easy, most only survived for short periord of time. Some of the non-clowfish hosting carpet species, S. tapetum and others, do naturally divided, others do not. Can't really commend on these unless I know the species. If you have a picture and post it we can comment. As is, this is the best I can do. Thank you for your response! I honestly do not know the specific species. I have included an image of it during the initial splitting process before it began to close and die (I hope I did the image sharing correctly). I look forward to hearing your thoughts! I do not believe my image posting worked. Let's try this again! You should inset the address of the image itself not the page. Last edited by OrionN; 07/09/2018 at 11:34 AM. It looks like an Atlantic Sun Anemone, Stichodactyla helianthus. Sometime anemone split with stress. I think that was what happened. In your case the anemone died. It was not a host anemone, these guys will eat all the fish including clown fish. Do you think it was the transition to a new tank that caused the stress or because our tank's values were off? Everything else seemed to be thriving. Also, since the anemone died, a couple of our corals seem to have taken quite a hit. Anything we can do? It may be sick, infected, traumatized. It was not well and often, spiting is the last ditch effort trying to preserve himself and he failed. These anemones, S. heliantus, usually are fairly hardy, but get plug out of the rock can cause a lot of internal injury, in additional to visible tears and surface injury. Anemones that naturally divided (not all anemones will naturally asexually reproduce), often will split when they are significantly injured, or stressed. Just water change is all you can do. Thank you so much for all your time and feedback (and figuring out how to shrink my image)! Though I love watching the anemones, we might focus on corals and fish for a while to not risk hurting another one and shocking our tank. It’s not anything you did wrong. It was likely on its way to death before you even bought it.